Mobile Unit Technician Hosea Stewart checks blood donor's pulse during a blood drive at Emory Johns Creek Hospital in November 2016. 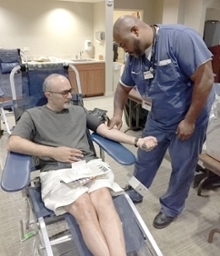 Emory Johns Creek Hospital will hold a blood drive on Monday, March 6, to celebrate Red Cross Month and encourage eligible donors to give blood. The American Red Cross says every two seconds someone in the U.S. needs blood. Since 1943, March has been selected as Red Cross Month to recognize how communities are helped by blood donations. Christina Vick, lab director for Emory Johns Creek Hospital says blood donors can bring hope to people facing emergencies. "Donating blood can help save a life or several lives," says Vick. "There is a constant need for a regular blood supply and donors can help people who need transfusions, like sickle cell patients." Donors should bring a blood donor card or driver’s license or two other forms of identification to check-in. To save time, donors can use RapidPass to complete their pre-donation reading and health history questionnaire. To learn, more visit redcrossblood/org/RapidPass. To schedule an appointment, visit redcrossblood.org and enter sponsor code: emoryjohnscreek or call 1-800-RED-CROSS (1-800-733-2767). Monday, March 6 from 9 a.m. to 2 p.m.